Last year I started following a woman named Tutti Bennett on Instagram. I discovered her through her daughter Cecily's account, and when I saw her photo, my first thought was, "I bet she'd be a whole lot of fun to hang out with". I sent a message to Tutti's daughter saying that I hoped I could meet her mother one day, and found out that unfortunately, Tutti and her family live in Australia, and although they travel extensively, there was no plan to come to Canada in the near future. Then in the summer Cecily mentioned that Tutti was going to be in New York in October, and as it turned out, she was going to be there the same time I was. It was fate. 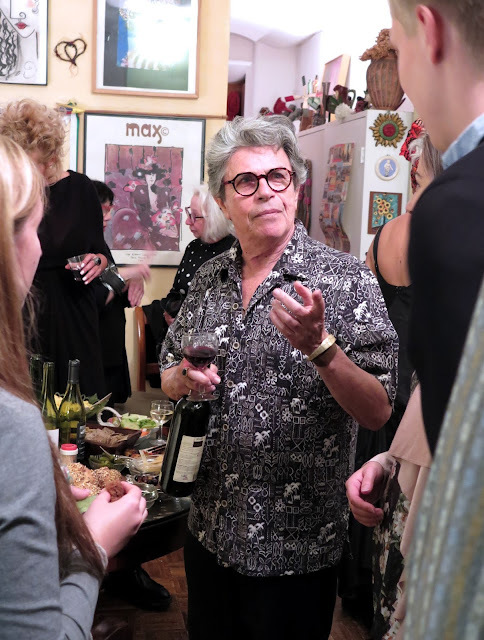 Emails were exchanged, friends in New York were contacted, and the ever gracious Debra Rapoport offered to host a gathering at her partner Stan's apartment to welcome Tutti and her family to New York. I had spent the afternoon at the Manhattan Vintage Clothing Show with Jean and Valerie, and at the appointed hour we headed to Stan's apartment. 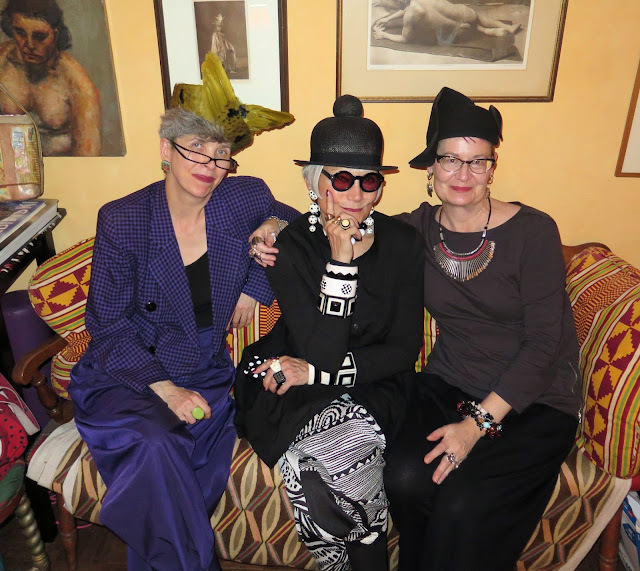 Valerie, Jean (aka The Idiosyncratic Fashionistas), et moi. 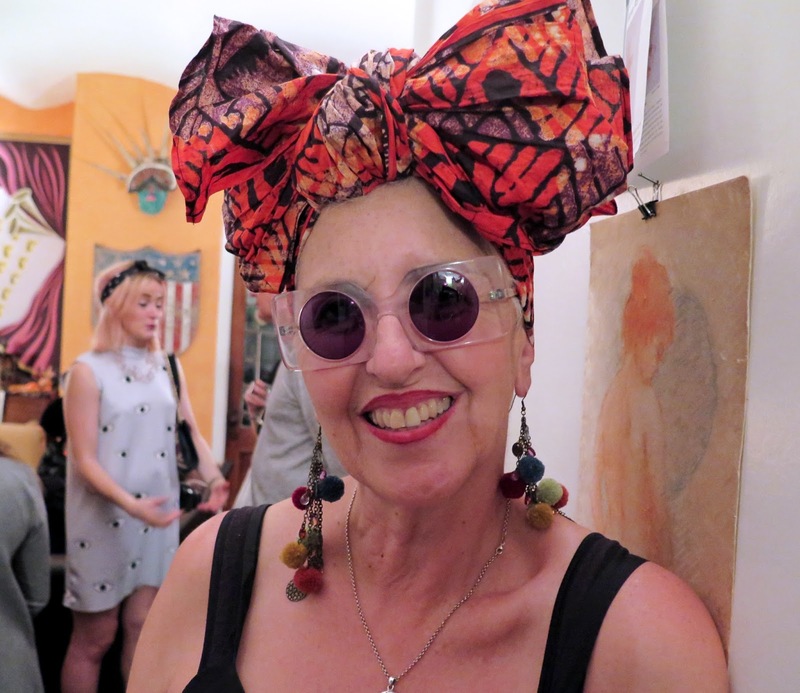 Valerie is wearing the beautiful feather hat she purchased at the Vintage Show. The funky and fabulous Tutti Bennett, in person! We squealed and hugged, and agreed that Instagram was pretty awesome for bringing us together. 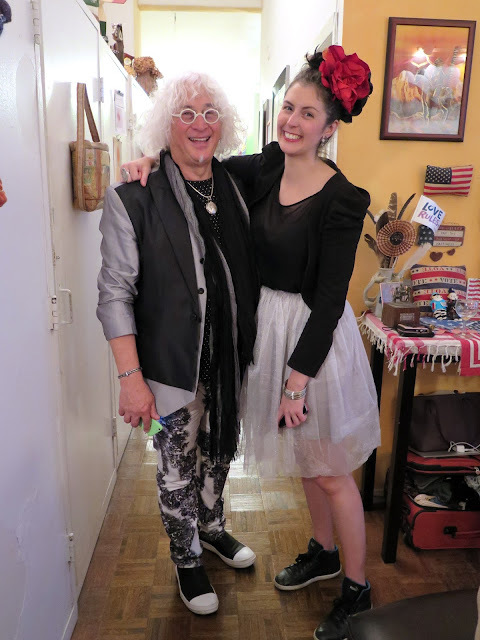 Tutti's husband Paul (aka The Cranky Guru) and daughter Sonia accompanied her to New York. Paul is a modern renaissance man - graphic designer, musician, singer, writer and philosopher. 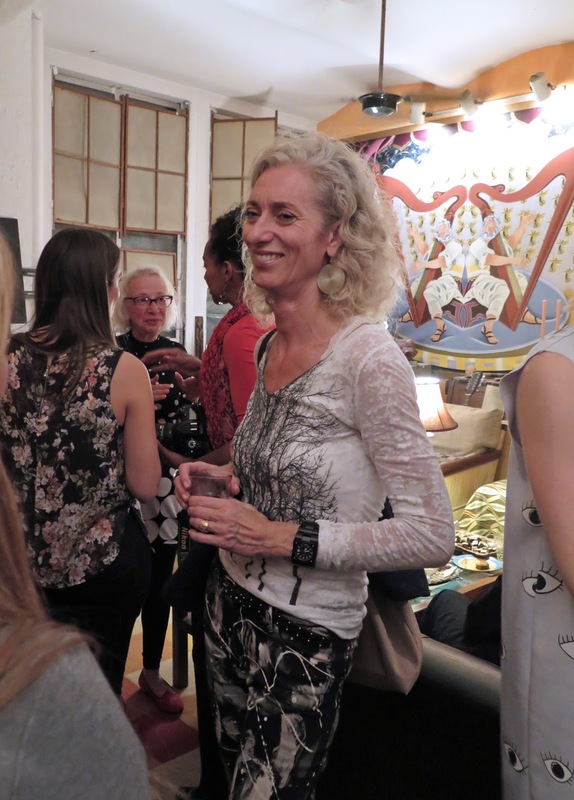 Sonia is a fashion designer who currently works for British designer Zandra Rhodes. The Bennetts are all very charming, with a great sense of humour, and are very engaging. They mingled with everyone at the party and made many new friends during their visit. 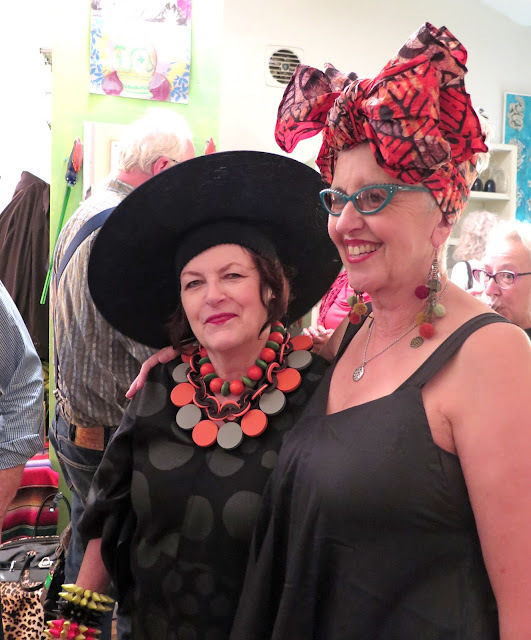 It seemed like every single person at the party had unique, and very visible personal style, and women like artist Elke Kuhn (left) were sporting the most drool-worthy accessories. Debra and Stan have an enviable talent for bringing creative people of all ages together at their parties. 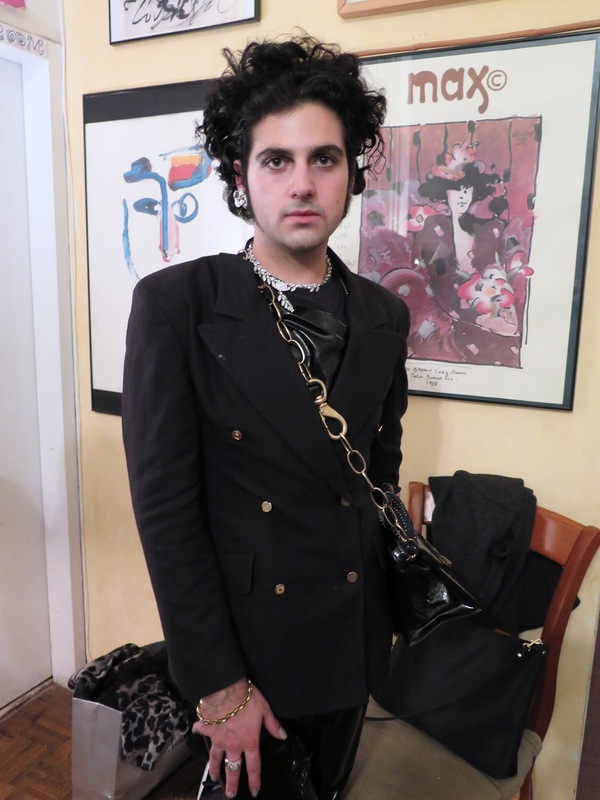 The young man in black above is Iman Chenonceau, a talented artist and designer. Iman accompanied us to brunch the next day, and held his own conversation-wise with a group of people who were almost all three times his age. The man in the centre is Spanish artist Fernando Diez-Cabeza, a very talented painter who completed a portrait of Lynn Dell Cohen, Advanced Style's "Countess of Glamour", shortly before she died. Unfortunately, I didn't get the names of his two companions. 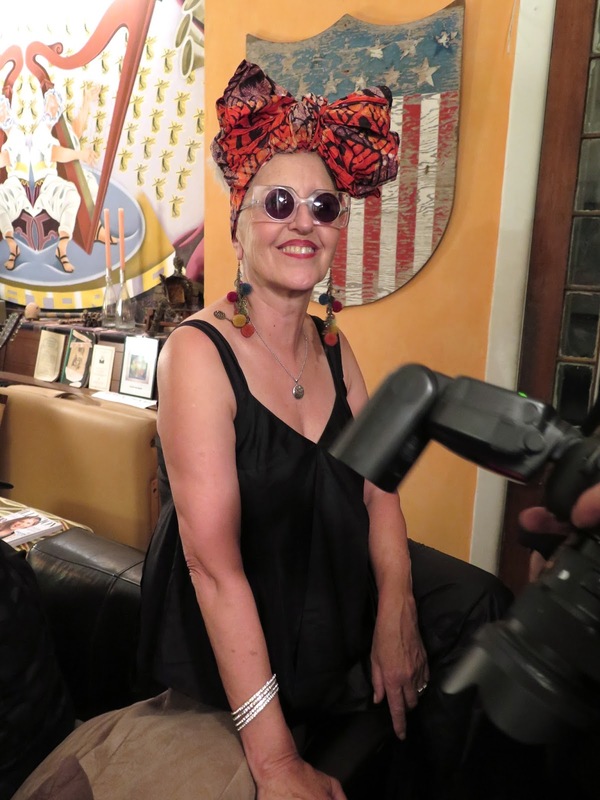 There were a couple of other Canadians in attendance, including Ruth, who was visiting from Vancouver with her husband, shoe designer John Fluevog. Speaking of shoe designers, the young woman on the right is Italian shoe designer Gioia Maini. I loved the print on her friend's dress. 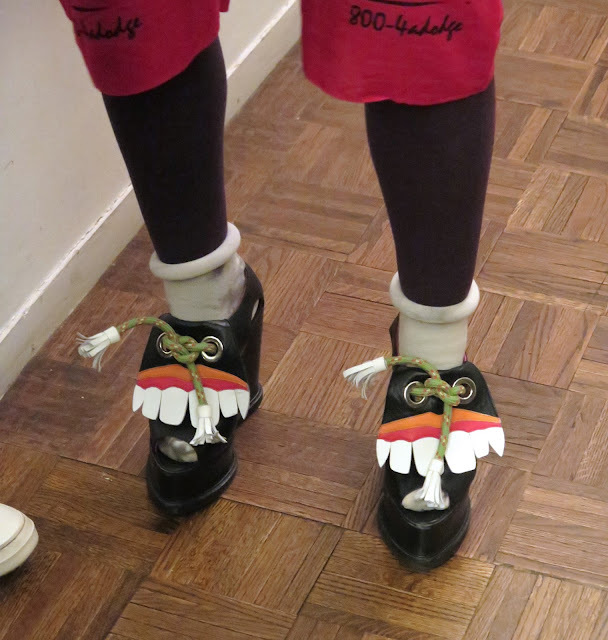 Maini was wearing shoes of her own design. You can see more of her colourful creations on her website. I loved this head-to-toe graphic black and white look worn by Claire, above. 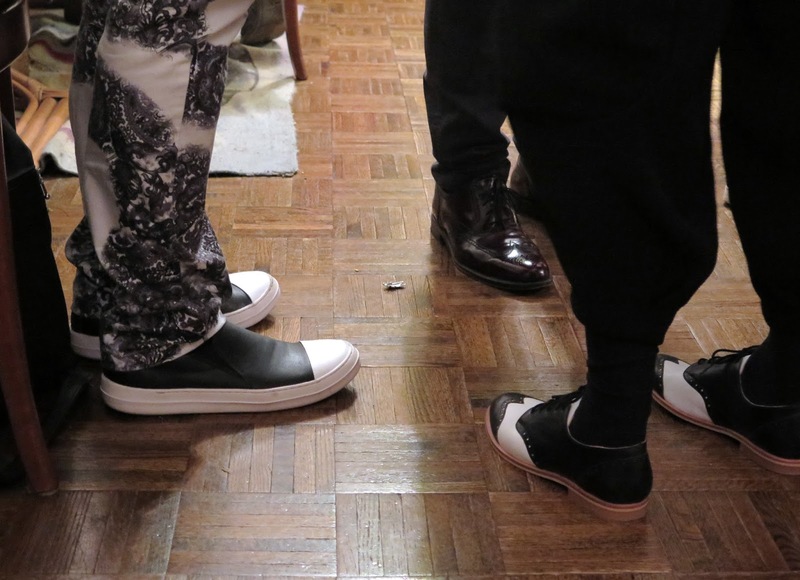 There was also a lot of black and white in the guests' choice of footwear. That small object on the floor turned out to be one of my earrings, which I discovered I was missing shortly after I took this photo. 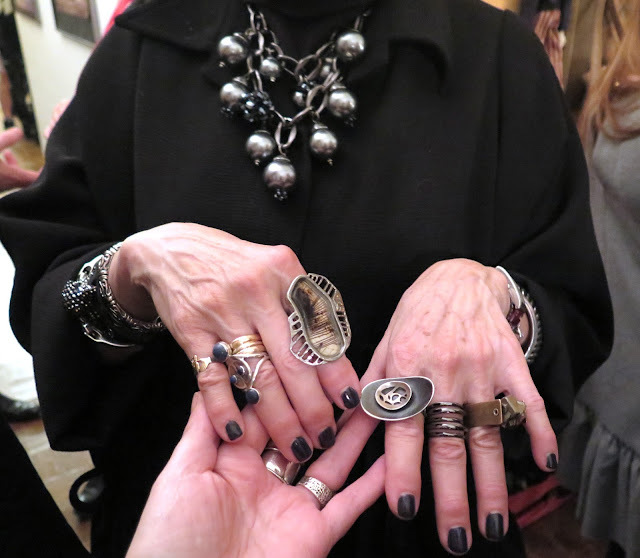 I was entranced by Mary's jaw-dropping collection of rings and her funky necklace. 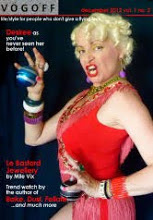 We were obviously kindred spirits, at least when it came to our jewellery. At some point Debra and I went out to the hallway to take some photos of her wearing the Freakish Yellow Skirt, which had been delivered to her by blogger Suzanne Carillo when she was in New York in September. Debra's addition to the skirt was the colourful shoulder attachment. I couldn't resist capturing an overhead shot of Ruth, Tutti and Ilona engaged in an intense conversation. 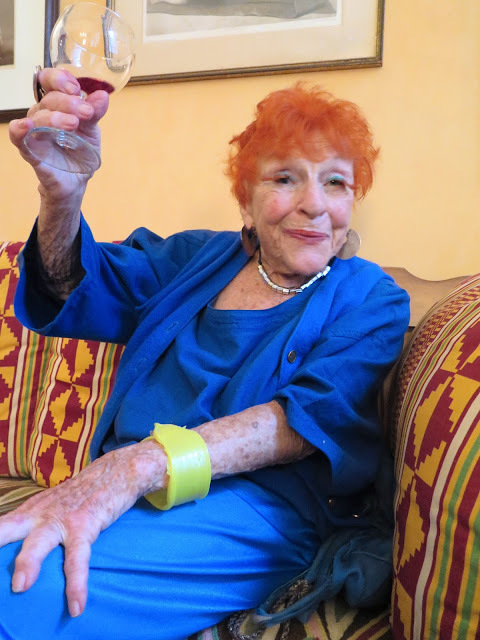 I took the opportunity to take a last photo of Tutti before leaving, and we exchanged hugs, grateful for whatever twist of fate allowed us meet in my favourite city, surrounded by creative and engaging people. Til we meet again! Wow! Looks like such an AMAZING party! So many interesting people all in one NY apartment. I bet it felt like you were in a creative fashion tornado. 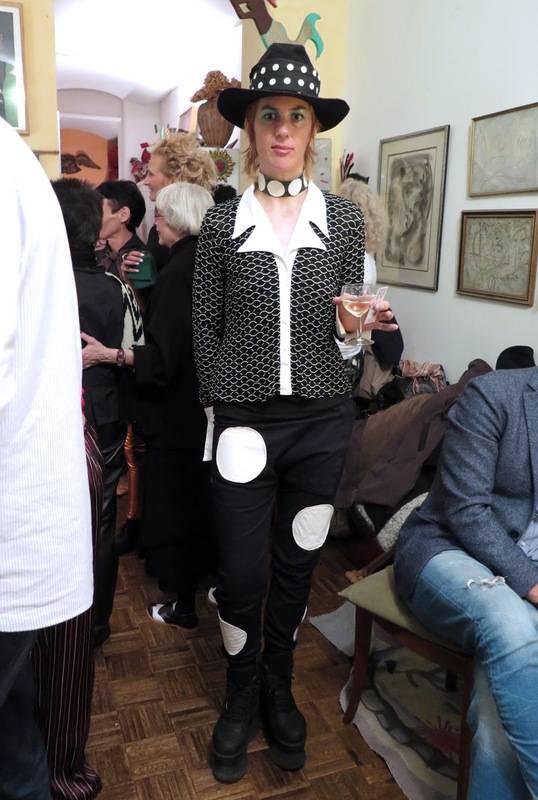 This is the party Andy Warhol would throw if he were still alive today. You have such amazing friends. I think I would be too scared to walk through the door! Thanks for this glimpse into your glamorous life. Oh my gosh! What a stellar group of fabulously creative people! I want to beeeeeee there! Thank you for all the pictures, Shelley - I would have been fangirling all over John Fluevog. This seemed like an an amazing party! With all those artists maybe more like the old fashioned salons? I've only read about them in books but they are still going on by the looks of things. 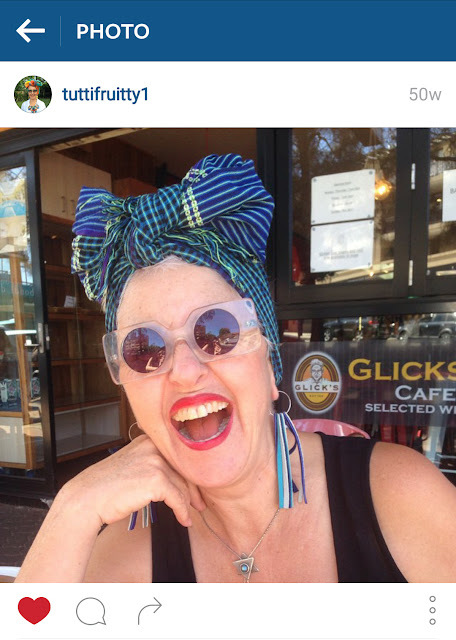 I can see why you wanted to link up with Tutti - she does look like a fun person and I loved her big bow. 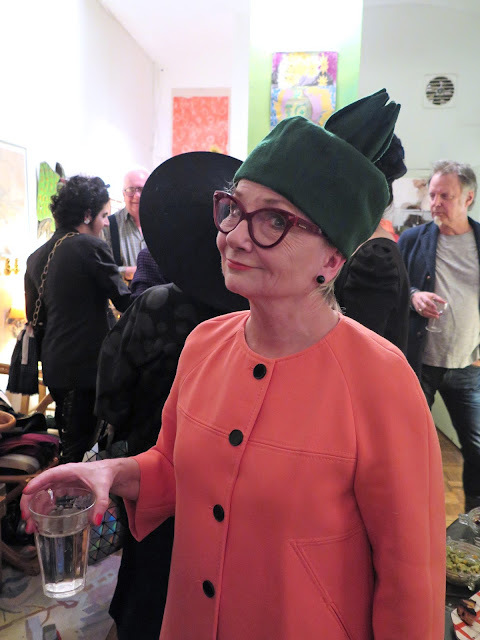 I was drooling along with you at the lovely accessories and you looked fab as well, I particularly liked your hat! Amazing party! You're in with the In Crowd. These are your people, Shelley. I'm glad you make the most of your time together with them. What a fabulous party Debra threw, plus how wonderful that she could also fit in the yellow shirt, which you generously photographed. Thank you for sharing this particular adventure. 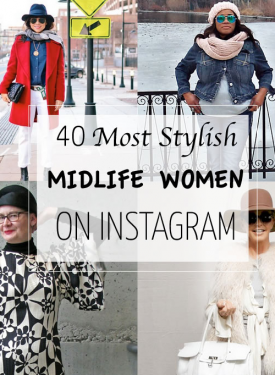 Who could imagine that Instagram would result in such a cool gathering? Now we know. Thank you for sharing...I so enjoy seeing all these people in their creative glory and I also follow their blogs. 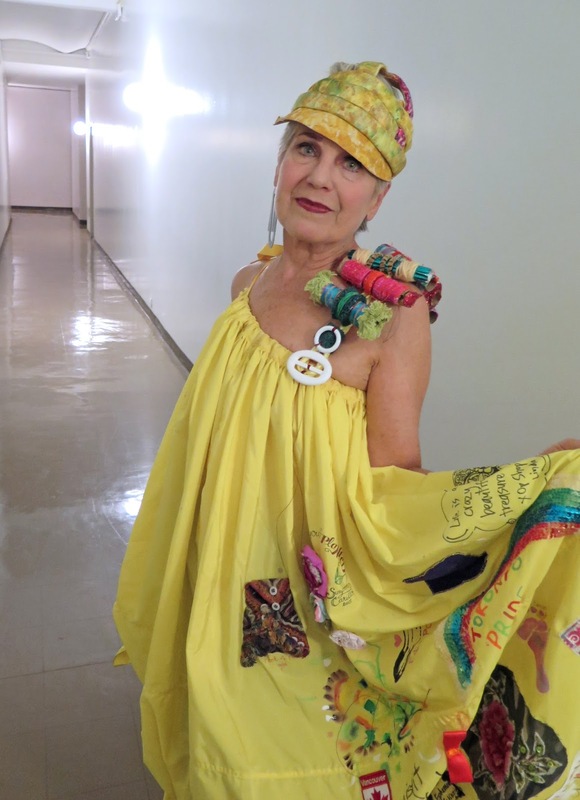 Debra did not disappoint wearing Melanie's "freakish yellow skirt" and adding on her fabulous touch to it. Yes, definitely the in crowd...like Jazzy Jack I'd definitely be starstruck if I personally witnessed such a gathering. So nice seeing everyone. And that was my camera photobombing an otherwise lovely image of Tutti! Despite all its evils, social media is the world's greatest enabler!! 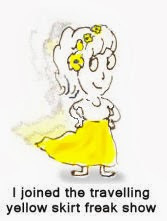 I have reconnected with kindy friends and old colleagues all across the world thanks to social media :) how wonderful that you were able to actualise your online friendship, such a blessing!! 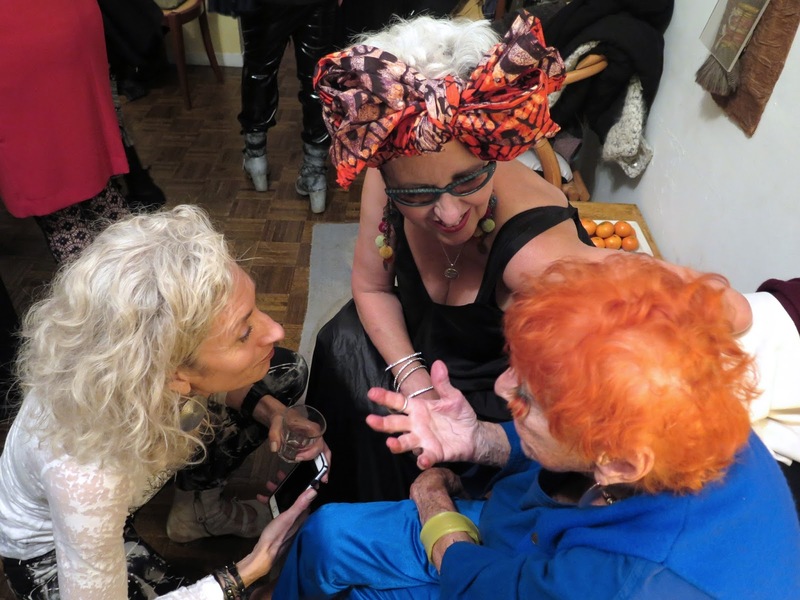 This is absolutely Fabulous (with a F*ck*n' Capital F) and the kind of things I love more about social media: the friendship, the possibility to contact kindred spirits and have fun together!! Glad you've enjoyed such a magnificent meeting!! it warms my heart to see this post!! Your post is fascinating in so many ways. Instagram and you were the magical connectors! How much fun to meet Tutti and everyone else in your photos. Looks like the party of a lifetime. Brava!